Synopsis: 322 BC. The Macedonian Empire is on the verge of civil war following the sudden death of Alexander the Great. As a boy, Andrikos, watched as Alexander's army marched through his homeland of Greek Ionia after defeating the Persians at the Granicus River on their way to the total conquest of the Persian Empire. Soon he will be embroiled in their world, forced to flee his old life due to an unintentional crime. Thrust into the army, Andrikos struggles to cope with the brutal yet necessary training which his superiors put him through to prepare for the coming wars of succession as Alexander's surviving generals seek to divide and conquer the spoils of Olympus. But Andrikos is not destined to be a nameless soldier; by chance he is chosen for a clandestine mission - and is immersed in a world of intrigue, violence and brotherhood. The path that lies ahead of Andrikos requires him to shed his immaturity to defend Alexander's legacy from those who would usurp it. Alexander the Great is dead and those driven to succeed him begin their machinations towards seizing power. Amid the chaos is a young man named Andrikos. Like many young men without a purpose, his life consists mainly of drink and women and floating through life unchallenged. He gets mixed up with a group of ruffians where he gets into trouble and is forced to flee. He joins the army to avoid his past catching up to him. It is then that he is introduced to the brutalities of war, of training, of battles to the death, of treachery. And once enlisted, he cannot get out unless he is killed. For a debut novel, this is exceptional. No stranger to battle and war, the author has written a vivid and compelling portrayal of what it means to be embroiled in action. The author holds nothing back, so be prepared for the brutality contained within this novel's pages. Some scenes can be disturbing to the feint of heart. Thankfully, I'm not one of them, so I was able to enjoy the book without hesitation. The author knows has seen war, and he knows the heart of a warrior and he is able to implant this into his characters. He also took time to describe how war affects the civilians and the hardships they face after the last battle cry is heard. 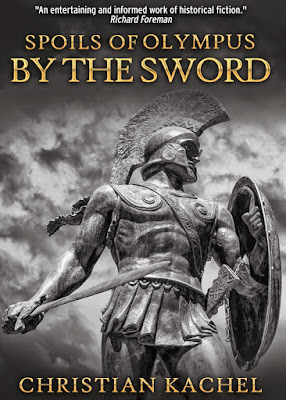 I love novels about Ancient Greece and this one had a wonderful storyline weaved among the hair-raising battle and warrior scenes. Looking forward to Christian Kachel's next novel!